Heat the oil in a large saucepan. Add the onions, curry leaves and chili peppers and stir until the onions turn translucent but not brown. Add the chopped tomato and sambar powder. Stir until the tomato turns mushy and expresses the oil. 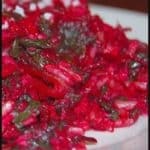 Add the spinach, mix to coat with the spices, and then add the grated beets. Cover and cook for a few minutes until the beets are tender. Now mix in the cooked rice and barley. Mix well. Add the coconut and either mxi it into the rice or just leave on top as a garnish. You can also add some coriander, if you like. Serve hot with the Ginger-Lime Dal (recipe above).